If you're not familiar with the Marketing Automation add-on yet, we recommend reading this article for an overview of everything it has to offer before continuing. With the Marketing Automation add-on, you can configure LeadSimple to automatically email, or send a text message to a prospect if they're opening your emails, clicking on links inside them and visiting your website. Note that Engagement Triggers are designed to initiate a sales conversation with leads who, previously, were cold prospects (not ready for a sales conversation), but now are actively engaging with the emails you're sending them and your website content. This will be important to understand as we go along. If you haven't done so already, go to the Billing page in your account and activate Marketing Automation by clicking the switch for that add-on near the bottom of the page. Like we mentioned above, some leads contact you who are not quite ready to have a sales conversation yet. These leads are valuable and you shouldn't let them slip through the cracks. Instead, it's highly recommended that you send these leads an email about once a month so that they don't forget about you. 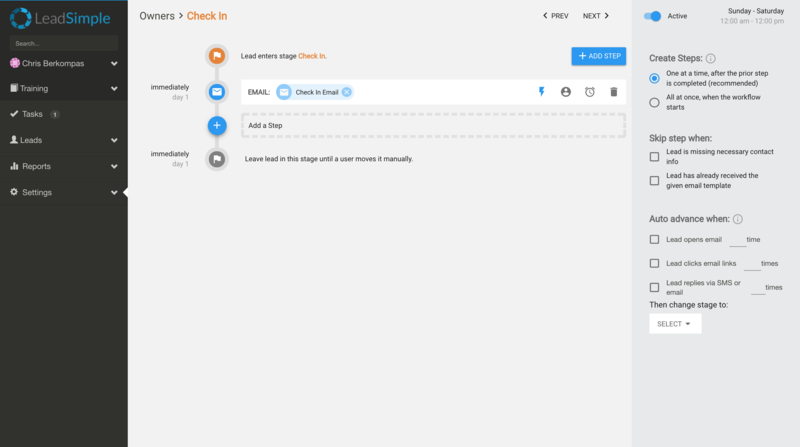 In LeadSimple, you can do this using stages and workflows. 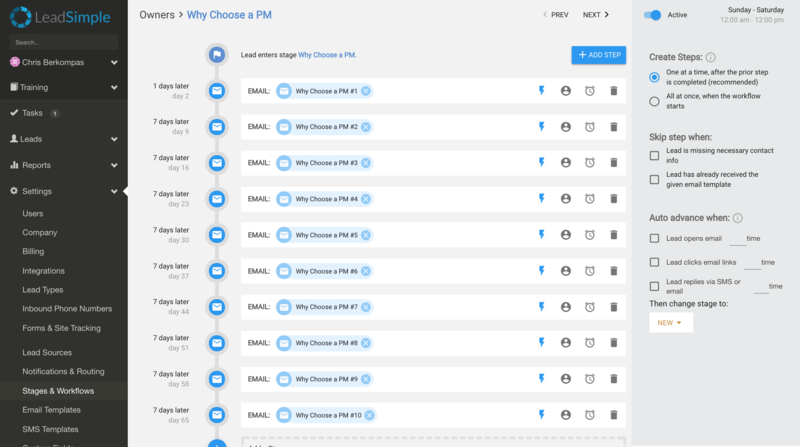 For this article, we've created an example workflow called "Why Choose a Property Manager". It contains a series of email templates which explain the pros and cons of self-managing a property compared to hiring a property manager. A delay of 7 days has been set on each of these emails so each one will be sent 7 days after the previous one. Now, if a prospect is receiving these emails and is actively opening them, clicking on links inside them and visiting my website frequently, I want to send a brief automatic email to them asking if they would be interested in a phone call where we could talk more about their needs and my company's services. This is where Engagement Triggers come in. In the right-hand sidebar, there's a section at the bottom under the heading "Auto Advance When:". This is where we'll configure our Engagement Triggers. The first one relates to leads opening your emails. We'll check the box and set the number to 5. 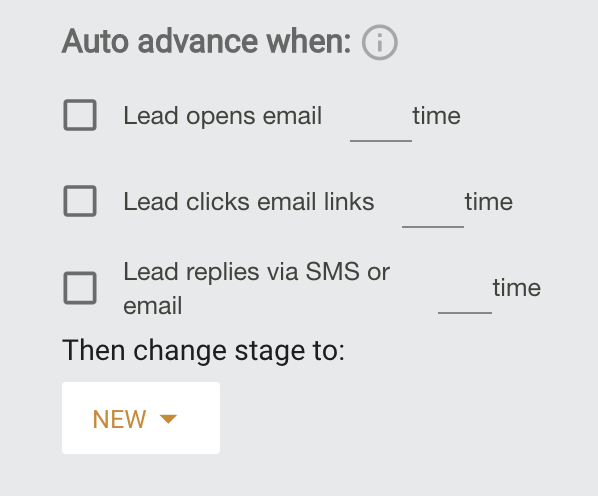 Now if a lead opens one of my emails 5 or more times, LeadSimple will automatically move them into the "New" stage. But we're not finished yet. 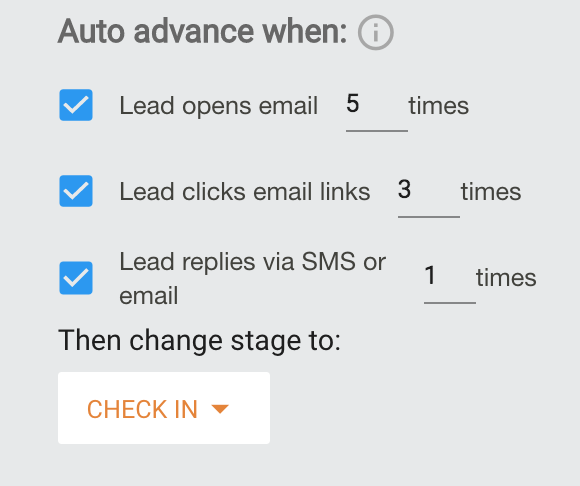 I also want to auto-advance the lead if they click links in my emails 5 or more times so we'll check that box and change the number to 5. Next, I want to auto-advance a lead if they reply to any of my emails or text messages 1 or more times. Finally, let's change the stage from "New" to "Check In". I configured a workflow inside the "Check In" stage which contains an automatic email, asking if the lead wants to talk on the phone like I mentioned above. This step is necessary for Engagement Triggers to work properly. Let's look at our updated Engagement Triggers again. Lead Opens Email: It's fair to say that most people don't open a single email more than 3 or 4 times unless they're very interested in the content of the email. If a lead opens an email more than that, it's probably safe to assume that they're an interested party. Lead Clicks Email Links: The same thing goes for clicking email links. If you go back to an email to click on a link 3 or more times, the odds are high that you care about the content that link brings to you. Lead Replies to Emails/SMS: There are 2 possible reasons why a lead would reply to one of your emails. 1) They are interested in working with you or 2) they would like to unsubscribe from these emails. Since prospects can unsubscribe from your emails using the link in the bottom of each one, it's more likely that they are expressing interest in your services by replying to your email. In light of that, 1 or 2 is probably a safe number to use for this trigger.